Philips 32PFL9705 review | What Hi-Fi? A high-end 32in TV might seem a frippery, yet there's an appeal to the 32PFL9705's elegant styling and extensive spec. The Philips might not be a telly that you really need, but it's definitely one you'll want. Unless, of course, you want Freeview HD. Over the years Philips has excelled at the unique – think of another manufacturer that produces a 21:9 TV, for example – but even so, we'd imagine it rues the decision to omit free-to-air high-definition TV from its current range. 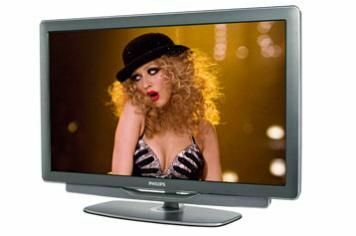 It's especially germane when you consider that rivals such as the Award-winning Panasonic TX-L32D25, have both Freeview HD and Freesat tuners. Still, the 9705's other attractions are many. It's a local-dimming LED-backlit set armed with every picture-enhancing feature in the company's arsenal, from 200Hz Clear LCD and Perfect Natural Motion to Ambilight Spectra 3, the three-sided variant of Philips' system designed to make viewing comfier and more enjoyable. There's no 3D, but that's no criticism: it's a matter of debate as to whether it matters in screens of this size. So, to performance. At first glance, the 32PFL9705 impresses hugely: it's got all the colour vitality and sharpness we've come to expect from the company's range, and for all its standard-definition limitations, the Freeview tuner's respectable enough, barring a hint of noise. Blu-ray pictures have dense blacks and pristine whites too – but peer closer, and you'll find that the darkest points suffer from a lack of insight. Tweak the set's menus – and this being a Philips, there are plenty of options to play with – and you can improve things to a degree, but all the same, some rivals offer more variety. The rest? The wi-fi-enabled online services work well, but are currently limited by a lack of useful content: again, others offer you more, at least for now. Upscaling is a mixed bag with DVD – noise can be intrude on some discs – while sound is excellent: few firms can rival Philips in that regard. That's not enough to redeem the 32PFL9705, though. It's a decent set and, as we said, a very desirable one – but that price, the lack of HD tuning and some other niggles conspire to undermine it.